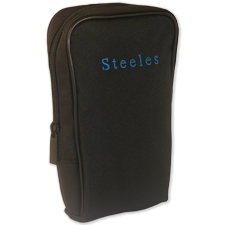 The Steeles Diagnostic Set Soft Case includes one large and three small interior loops to fit the Welch Allyn PanOptic Diagnostic Set. Case only. Diagnostic set components not included. Measures approximately 4-3/4" L x 2" W x 7" H. Weighs about 3 oz.